The body can be likened to a car, in that it needs regular servicing and maintenance as it gets older! Osteopaths treat the whole person not just conditions, and thus a very wide variety of different problems can be helped. Osteopathic treatment is aimed at releasing strains and stresses that have often accumulated in the body over many years, thus improving the circulation to all parts of the body. The result is often an improvement in many different aspects of health. This means that suffering pain, stiffness and poor health are not an inevitable part of getting older. Backache affects four out of five people at some time in their lives, backache is the most common complaint treated by osteopaths, both long standing and early back and neck pain. Over half of our patients suffer from back problems, most back pain results from mechanical disturbances of the spine, postural strains, joint derangement and disc injuries. But Osteopaths are not just ‘back specialists’, they treat many other conditions successfully, here are just a few of the many. Headache: neck and shoulder tension, caused by stress, whiplash injury or by activities such as sitting at a VDU all day, normally respond well to osteopathic treatment. Joint and Muscle Strain: Osteopaths can treat joint and muscle strain in any part of the body, including the hips, legs, knees, ankles, feet, wrists, elbows, shoulders, arms and ribs. Pregnancy can put excess strain on the back which can cause back pain and discomfort; many women find gentle osteopathic treatment can help the body to adjust, recover and bring great relief. Sports Injuries: Osteopathic treatment can benefit the sports men and women at all levels. If you are eager to get back to your sport quickly after injury, or have a problem which is preventing you from performing at your best, osteopathic treatment can help you reach your peak level of fitness. 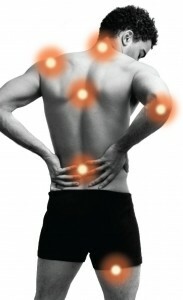 Sciatica: this refers to irritation of the sciatic nerve that supplies the leg. However, it is often used to describe any pain in the leg, whatever the cause, whether it is related to circulation, pain referred from a back injury, trauma or nerve irritation. The most common causes of sciatica can usually be successfully treated. Arthritis: Osteopaths spend a large amount of their time in dealing with the pain and suffering caused by arthritis. Many people mistakenly assume that arthritis is untreatable and that they must learn to live with their symptoms. In many cases, osteopaths are able to help considerably. Pain relief and lifestyle management improve the quality of life for arthritis sufferers. © Copyright 2019 East Coast Osteopaths. All Rights Reserved. Designed by Matt Porter Web Design Limited.